The deli department at Saylor’s Market makes parties, dinners, gatherings and home-cooked meals easy and delicious with a wide range of fresh deli cheeses and meats available in Newville, PA. Our team can make a special party tray for a big event or occasion, or you can choose from one of the many pre-arranged trays we have available any time. Whether you need cold cuts for your lunches or a serving tray to host guests at your party or home, our friendly staff members will help you find what you are looking for and ensure that there is something for everyone at your table or your party. Saylor’s Market provides fresh deli cheeses and meats in Newville, PA for football parties, graduation parties, work events, school functions and much more. We also have freshly sliced meats and cheeses for sandwiches, salads and casseroles to accompany dinners. Whether you are looking for convenient and tasty appetizer before dinner or a full plate for dozens of guests, you can find a delicious and affordable party tray in the deli section. 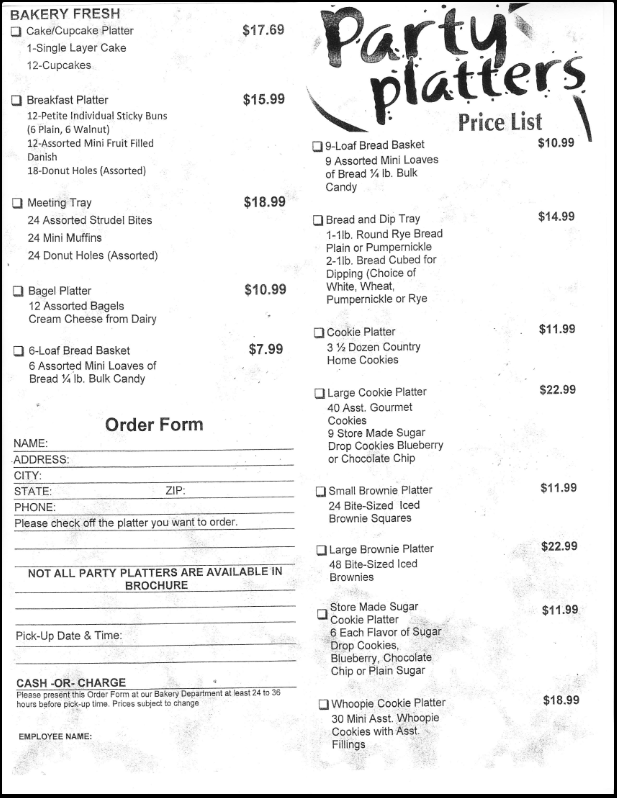 In addition to fresh deli cheeses, meats and crackers, we also have sandwich trays, fruit trays and combination platters to please all of your guests. We make all of our platters, sandwich trays, cheese trays, fruit platters and more from the freshest and most delicious ingredients. Find a tray to pair with any wine, a sandwich tray to make serving partygoers easier, a healthy snack tray for a school event, or a fruit tray for a work function. 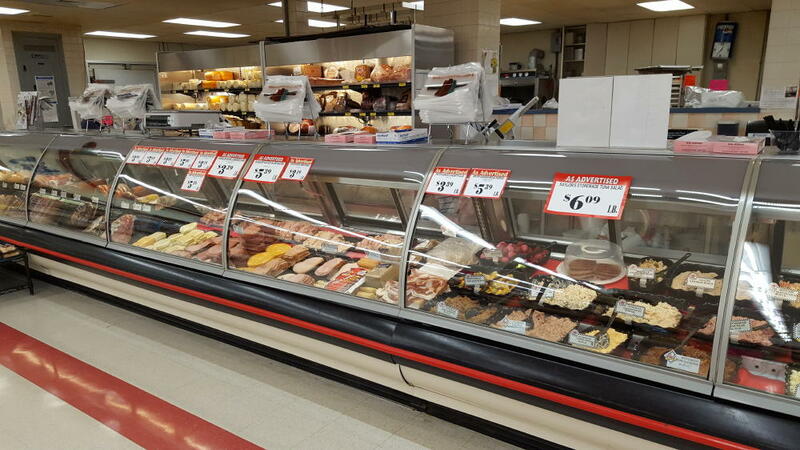 Visit Saylor’s Market in Newville, PA today and find fresh deli cheese and meats for sandwiches, party trays and more. 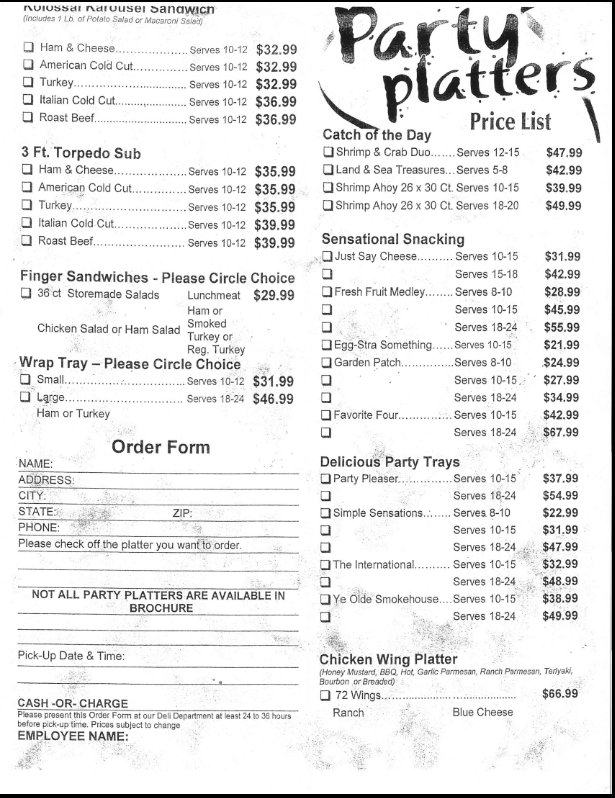 Call in an order at 717-776-7551 or stop in and chat with our friendly, helpful staff. And check out our Party Platters. Images and price lists below! Click image below to open pdf.